Back in February I got fired from my post office job. I couldn't type fast enough to meet the standard, in part because I only use two fingers on each hand when I type, and in part because I was working graveyard shifts and couldn't stay awake. It's the only time I've ever been fired, and it was kind of a bummer. Fortunately, at that point I already had a job lined up doing reservations with jetBlue (I had been hoping to do both part-time, but now I'm a full-time airline employee). I'm getting paid much less than I was by USPS, but there are some very nice perks: I have health insurance, I get to work from my apartment, and I get to fly for free! A couple of weeks ago I finally got enough time off to take my first free flight. Not surprisingly, I jetted off to New York. Standby travel is more stressful than I anticipated, but I don't like to complain, and I did get on the flights on the days that I wanted to, so I won't go into detail about that. It doesn't seem like it's already been about ten months since I moved back to Utah. It felt so good to be back. As I stepped off of the plane and began walking through the terminal, the Glenn Frey song "You Belong to the City" was playing. I don't like that song, but it seemed very appropriate. This was the weekend, of course, of the Lost series finale. I had watched many episodes with Erin, Jill, Tricia, and other friends, and wanted to rejoin them to say goodbye to the show. To prepare myself, my friend Laura and I went to the Paley Center (formerly the Museum of Television and Radio) the day before to attend a Lost party of sorts. We joined about 200 other fans in trivia contests, watching an "enhanced" version of the 2004 pilot episode, and listening to a panel discussion. I thought the panel was going to be producers and cast members from the show, but it turned out to be six TV critics. Not what I had hoped for, but still interesting. Sunday night I joined Erin, Laura, and a few others to watch the finale. There were several emotionally satisfying moments, but I felt a little unfulfilled intellectually. I won't give any more details in case some of you haven't seen it yet, but I do have some things I want to say about TV finales in a later post. --I also got a slice of pizza from the dumpy deli I used to frequent when working at Columbia. Sadly, the nearby church is still not selling burritos. That's about it. It was a super fun, super fast trip. I only spent about $100 total, including subway passes. A big shout out to Joel for letting me sleep on his couch. Thanks Joel! Hopefully I'll be back for another visit soon. The Paley Center events usually do have cast and producers! I'm sad for you that this time they didn't. I'm really excited to try out your food list--the only place that I've actually eaten at is Gray's Papaya. Dude, I have to ask, though--how did you survive 321 typing like you do? I'm slightly jealous. I love New York, and Gray's Papaya, and LOST, and pizza, and chocolate. And flying for free. 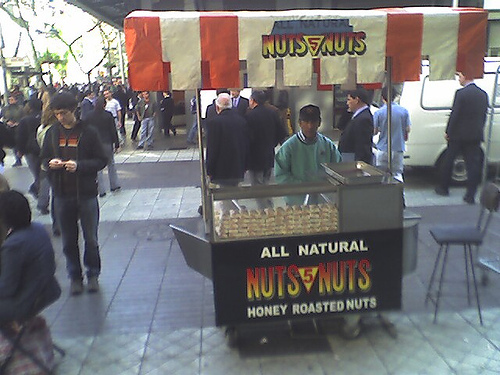 Nuts5Nuts! LOL! I love that rivalry. I miss New York and Dinosaur BBQ too! Living right next to it was like a dream come true.